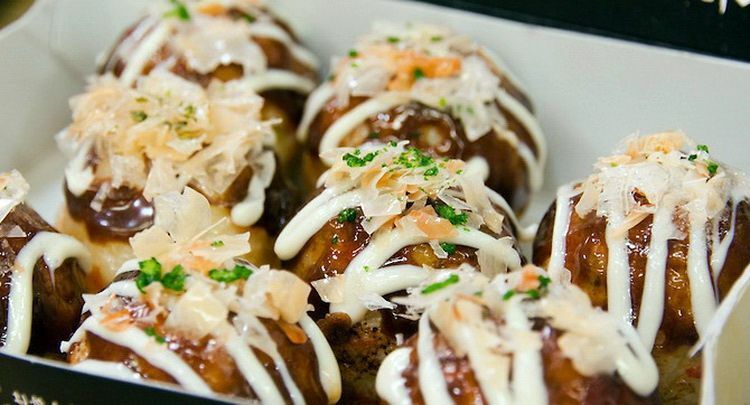 Takoyaki is one of the Japanese food that have a shape like a ball of cute and made from flour and sprinkles katsuobushi and served with various sauces. Usually these foods have the contents of squid or octopus mixed with simple seasoning and sauce takoyaki Japanese specialties. But because it is the tongue of us who are not familiar with snacks made from octopus or squid, so now many sellers modify it. Of course, by modifying making takoyaki current price can be reached by the public at large. If the original is certainly much more expensive. In a restaurant in Japan, the price of food is still quite expensive considering the material is too expensive. In addition to the contents, how to make takoyaki we give this time is also much simpler and simpler without mold. In the modern era is a lot of recipes of Japanese cuisine has become a new culinary trend in Indonesia. As an example chicken katsu, shrimp katsu, tempura shrimp, teriyaki, dorayaki and many more. Formerly heck average price of Japanese food is relatively quite expensive. Usually only in beberaoa Japanese restaurant in the mall.  But because of interest from the general public quite a lot, so many modified with common materials that are cheaper. As well as takoyaki material that we will create it. Japanese takoyaki original recipe has been slightly altered so that cheaper ingredients. 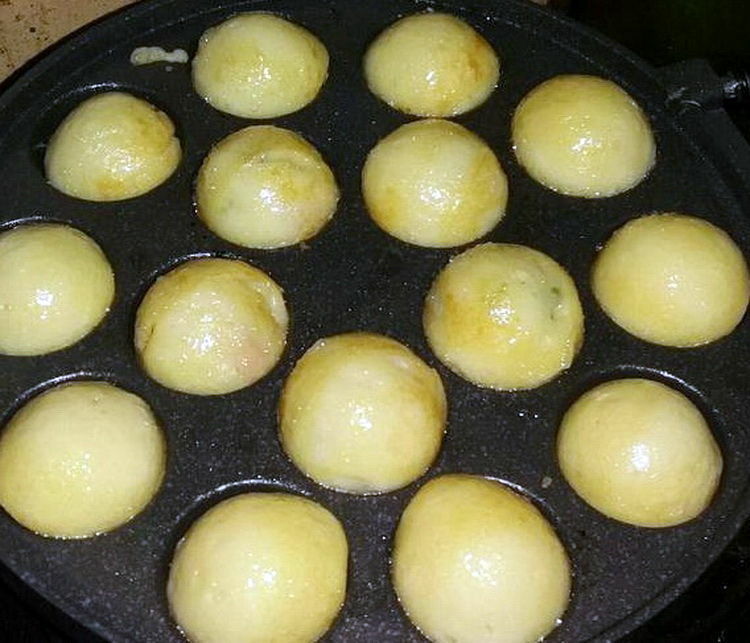 Moreover how to make takoyaki also adapted to the circumstances. How to make takoyaki original Japanese-style restaurant is actually quite easy and simple. Staying takoyaki mixing materials that have been prepared and then cooked in a special pan. But the problem is a special pan is not sold freely. In some areas actually will be difficult to find sellers of this takoyaki mold. The solution is actually quite easy. We bia using molds dorayaki more simple. if it does not exist, we can also use mud cake mold. But not too much batter takoyaki are included yes. Later happens too big. Only half of high enough pan to incorporate this takoyaki batter recipe. Its main ingredient is wheat flour that has a lower protein content of approximately 150 grams. Chicken eggs were a great size of approximately 2 points. Shake loose outside yes. Baking powder of approximately 1 small spoon. Liquid milk of approximately 120 ml alone. Katsuobushi little or approximately 5 grams to mix the dough takoyaki. Chicken flavor bouillon powder or meat according to taste or approximately as much as one small scoop less. Water to taste or approximately 350 ml alone. Katsuobushi for sprinkling of approximately 5 grams. Octopus or octopus that has been cooked or boiled and cut into small pieces to taste. Contents can be replaced with chicken, shrimp, calamari, meatballs, sausage, cheese or other. Typically used better octopus boiled from the seller so that more practical. If you can not boil yourself then a small cut. Chili sauce to taste to taste. Takoyaki sauce if there is sufficient according to taste. First we though katsuobushinya. Boil together with water that has been prepared to actually boil and let stand over low heat for about 5 minutes. After that matkan and wait a while until the next cold strain. This step can skip if you do not wear katsuobushi. Enter their liquid milk and stir together until well blended katsuobushi above. Pour broth into a powder container then stir again sampau above average. Enter a chicken egg is beaten off then stir together the dough ingredients takoyaki recipe above. Take a new container and mix low-protein flour and baking powdernya back then stir until smooth. Enter the flour mixture into the container before the contents of the milk back kemudina stir until blended. Strain the batter above so that there are no lumps of flour. Prepare the mold for making takoyaki and wait for it to heat. Do not forget to spread first with margarine on top. Takoyaki Pour batter into it according to taste and then immediately fill with octopus or other packing material. Once cooked remove from heat. Repeat until all the recipes have been roasted Japanese takoyaki.